Many people have difficulty digesting grains and find that they need to eliminate them from the diet for a healing period (some say forever) in order to heal the gut and improve digestion. The GAPS, or "Gut and Psychology Syndrome" diet is fantastic for anyone who suspects they may have underlying gut issues, or anyone plagued with the various auto-immune conditions that ultimately begin in the gut such as psoriasis, eczema, asthma, and rheumatoid arthritis. The GAPS Protocol also addresses many neurological or mental issues caused by improperly digested proteins being absorbed into the blood and in some cases (such as with the morphine-compounds formed during the breakdown of gluten and casein) crossing the blood-brain barrier and eliciting a neurological and mental effect. Do you get very sleepy after consuming a meal containing wheat or dairy? If so, you might want to consider gut repair, as it is very likely that you are not completely breaking down gluten (wheat protein) and casein (milk protein), and are absorbing them through the intestinal wall when they have degraded to gluteomorphine and casomorphine respectively (compounds with an opiate effect). The formation of opiates is a normal stage of gluten and casein digestion, but for those with a balanced gut, the proteins are further degraded and dismantled before they are absorbed and do not have an opiate effect. Having a 'leaky gut' that absorbs partially digested nutrients has enormous long-term health ramifications, and should be taken very seriously and addressed quickly. For people who do not experience such severe symptoms, a regular break from grains or even simply a reduced grain intake can greatly reduce the impact of niggling autoimmune conditions as well as improve their moods, energy, and mental clarity. I am definitely one of those people! The problem is, many grain-based foods are just too damn delicious. Like pancakes. Complete deprivation of something that gives you joy is not good for the soul, and simply is not a long-term solution. 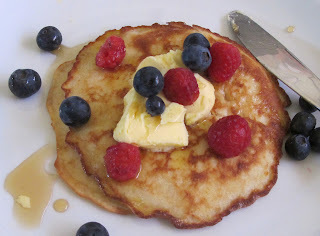 The solution IS making some healthy, incredibly satiating (and I would argue more-tasty-than-usual) paleo pancakes! These pancakes do not taste overly heavy, but you will notice you simply cannot put as many of these away as you could with regular, white-flour pancakes. The taste is rich, nutty, and sweet and the texture is moist due to the high fat content in the almonds and coconut oil. They are also surprisingly fluffy given the relative density of their ingredients. They tick all of the boxes - sweet, satisfying and seriously nutritious! There is no way around it, these are delicious and you simply have to make them. Anyway... let's cut to the chase. Gently melt the coconut oil for the pancakes and mix all ingredients together. Heat the remaining coconut oil or ghee in a medium-hot frying pan until very warm. Pour half of the batter into the frying pan and wait for small bubbles to start rising through the batter. At this point, flip the pancake with a spatula and fry until springy (usually only a minute or so). 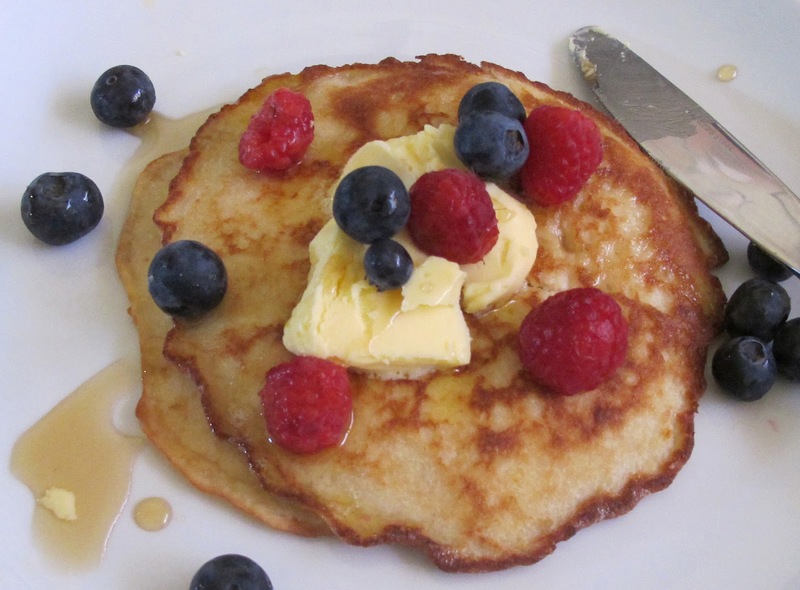 Repeat with the remaining batter and serve with raw butter, cream, nut butter, berries, maple syrup, honey, shredded coconut, or anything else that you enjoy with pancakes! Oh wow...these looks super amazing! I really love your blog! Student of Naturopathy and Nutrition. Food and nourishment-obsessed. Student Pilot. Animal lover and animal eater. (Amateur) violinist and singer. Believer in combining aspects of paleo, primal, WAPF, Ayurvedic, and Traditional Chinese Medicine principles for a natural and individualised approach to diet and lifestyle.